I bought a pomegranate last week and then wondered what to do with it! So I thought I’d make a Lamb Tagine, I used the recipe from my Good Housekeeping book but bumped up the veg content to make it go further and make it healthier. I topped it off with chopped coriander and the pomegranate seeds which I loved by were not so popular with my husband! 1. Cut the lamb into 4cm cubes. Place in a bowl with the ginger, ground coriander, saffron and 1 tbsp oil. Season, cover and leave to marinate in the refrigerator for at least 4 hours, preferably overnight. 2. If using pearl onions or shallots, immerse them in biling water for 2 minutes, drain, refresh in cold water and peel. 3. Heat 1 tbsp oil in a heavy based flameproof casserole and brown the lamb in batches, using more oil if necessary. Add the garlic and stir over the heat for 1 minute. 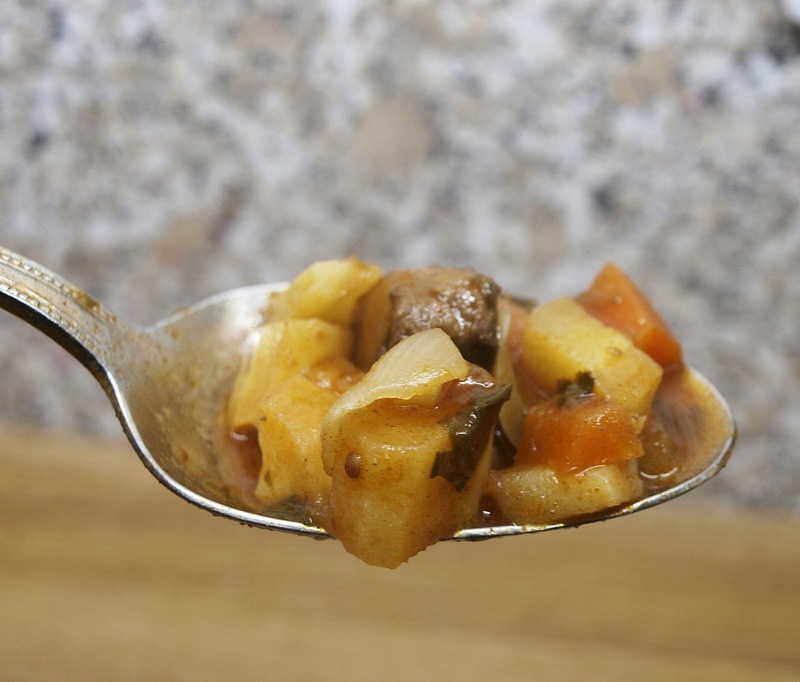 Add the onions and the cubed vegetables and cook over a medium heat until slightly softened and caramelised. 4. Return the lamb to the casserole. Stir in the flour and tomato paste, then add the stock, sherry, herbs and cinnamon stick. Season with salt and pepper. Bring to the boil, cover and cook at 180C for 1 1/4 hours, stirring occasionally. 5. Discard the cinnamon and bayleaf. Add the dates and honey and return to the oven for 15-20 minutes. Garnish with coriander and serve with couscous. I think this dish looks so delicious! Lots of ingredients and very appetizing! I love a good tagine and the pomegranite seeds make it look so pretty. I LOVE tagine Janice AND I saw that recipe in Good Housekeeping and saved it! LOVELY looking meal and so prettu too…..invite me next time! Mmmmmm….. Delicious! 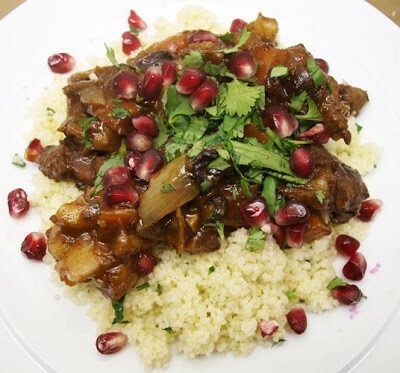 We love adding pomegranate to tagines – you could use the molasses if he isn't keen on the seeds? lovely janice! can I join the party with Karen? Adore tagines! Really like the addition of pomegrante for that fresh kick! This tagine looks really delicious! I love all of those middle eastern flavour combinations and pomegranite seeds always make everything so pretty, don't they? Such a joy.